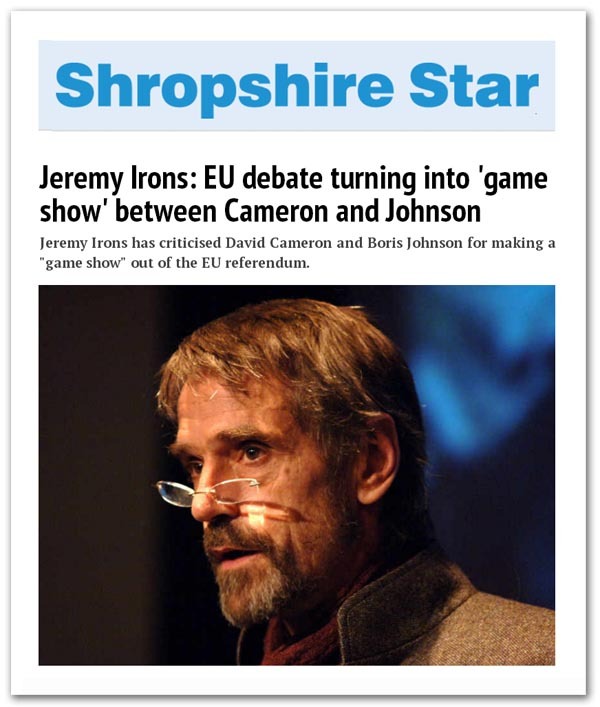 Finding its way into the Shropshire Star and other papers, including the Mail online is an agency report of a clip from BBC Radio 4’s Today Programmeinterviewing Oscar-winning actor Jeremy Irons. This 67-year-old actor (the same age as myself) and, unlike me, previously a Labour Party donor, told the programme of his “disillusionment with politics”. And on the EU referendum, he complained that David Cameron and Boris Johnson were making a “game show” out of it, failing to respect us as voters. This latter comment, we would like to think, is very significant – and certainly sufficiently so for a number of papers to carry it. However, you have to give them nil points for self-awareness. In order to address the issue of the referendum being turned into a celeb-style game show, they have to find a sleb to put the boot in. However, the point is made: there is by no means universal approval of intervention of Mr Johnson in the referendum campaign. Typically though, the resultant degeneration into a “game show” is attributed to the politicians concerned. No mention is made of the enthusiasm of the media for this development, allowing them to focus on personalities rather than the issues. In transforming the media coverage, though, Mr Johnson’s intervention does present real problems for campaigners, and especially leave campaigners. Some regard his high-profile presence as a good thing, giving the leavers “star” quality, but the actual effect is – as Irons complains – to turn this into a personal clash between “Boris and Dave”. What Johnson supporters don’t realise, though, is that the currency of this contest is prestige – which makes for a very unequal match. The Prime Minister of the United Kingdom, against “Bumbling Boris” will win every time. People (some people) may like “Boris” for his entertainment value, but voters in the actual polling booth will think differently. If then the contest is between two individuals, then we have moved away from an issue-based contest – a competition between ideas – and have entered the territory we didn’t want to be in. The debate, such that it is, has become dominated by the “he says – she says” dynamic. As such, facts don’t get a look in. The Prime Minister on the one hand, is building his case on a foundation of lies while Mr Johnson, lacking anything substantive, is making it up as he goes along – neither bears any relation to reality. Since this is now personal, the only way this can be successfully deal with is at a personal level – playing the man rather than the ball. The Prime Ministers, relying on the prestige conferred on him as holder of the highest political office in the land, must be transformed into “Dodgy Dave”, the political chancer, trying to pull a fast one over the British public. This means confronting Mr Cameron’s lies – and in particular his fictitious treaty that he has supposedly brought back from Brussels – and branding its author a liar. Only then can his claims be discounted. For the leavers, though, this is not enough. That we are able to discredit “Dave’s Dodgy Deal” cannot be treated as sufficient to motivate a majority to vote to leave the EU. As we have said so many times, we must offer a credible alternative and then we must be able to reassure voters that this alternative is safe and achievable. It is here that Mr Johnson becomes a real problem. Unable to offer a credible alternative, much less reassure voters that it is safe and achievable, his residual prestige is sufficient to have him being seen as representing the entire leave campaign. That then puts us in a position of having to discredit and then disown Mr Johnson. Again, facts don’t get a look in, No more than Mr Cameron does Johnson trade in facts. People believe what he says because it is him saying it, not because of its intrinsic merits. Once again, therefore, it is personal. Boris the “blond bombshell” and next leader of the Conservative Party, de facto leader of the “leave” campaign, is listened to. Boris the “idiot”, making it up as he goes along, can be discounted. Effectively, only when we have cleared out the rubbish can we get down to discussing the issues – something neither the politicians nor the media want to do. Nor indeed are the main campaign noise-makers at all interested in the key issues, offering the alternative and convincing reassurance. And it is clearly here where we have our main problem. Discussing the issues at this time, or jousting with the “remain” campaign, is a complete waste of time. The priority must be the neutralisation of the “Boris and Dave show”, by whatever means necessary. This is where I stand, even though I am aware that this is a highly contentious issue among our own supporters. Much as I would like this to be a gentle and polite debate about the issues, conducted according to the rules between equals, this is not going to happen. Mr Cameron and his supporters are already breaking the rules, lying freely and frequently to make their case. On the other hand, Vote Leave has its own agenda which seems to have precious little to do with winning the referendum. Being good little gentlemen simply isn’t going to cut it. We are in a fight to the death, with no holds barred. Of course, there are those who want to sit on the sidelines and keep their hands clean, parading their moral superiority over those who are getting stuck into the fight. There are the Tory Boys of Vote Leave who regard the campaign as their personal property, there is the “GO” movement, the main function of which is to provide a playground for Farage and a dysfunctional group of Tory “eurosceptics”, and then there is Mr Banks’s increasingly irrelevant Leave.eu which doesn’t really seem to know what it wants. To cut through all this dead wood and engage the real enemy is going to take the most extraordinary effort – and some of the responses on my own comment threads over the last few days makes me wonder if we’re up for it. In a dirty, deadly fight, the determination by some to keep to the supposed moral high ground would mean we make no impact whatsoever. In dealing with real people, on real issues, fighting against unprincipled liars on both sides – and those who are prepared to break every rule in the book – we have to be focused and ruthless. Worrying about our image or listening to prissy hypocrites telling us we are being aggressive is simply an unwanted distraction. If we are going to win, we are going to have to get up close and personal – taking no prisoners. Nobody gets to win and keep their hands clean. Next Next post: Taking IDS’s Lead May Other Senior Tories Start To Tell The Truth!